This book provides a comprehensive overview of onboarding library staff, paraprofessionals, and student workers in academic libraries. 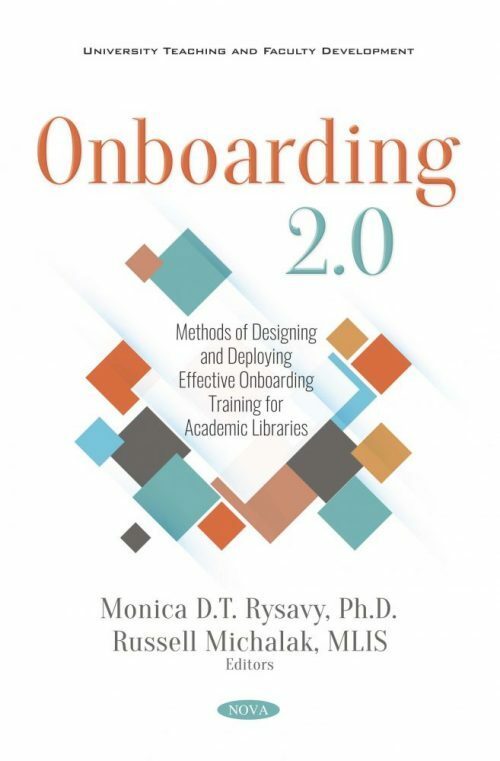 This book details examples of current literature regarding onboarding and libraries, and highlights the use of cases concerning institutions’ efforts creating onboarding programs for library staff. The chapters in this collection focus on a variety of onboarding practices geared towards training new hires within academic libraries. The use of cases provided emphasizes practical suggestions to improve processes and are often applicable to both library staff and student workers. This book is a must read for all administrators, trainers, and instructional designers as tips, best practices, and lessons learned are applicable to any academic department seeking innovative ways to onboard their staff. The contributors to this collection are associated with colleges and universities from around the United States. The authors have a broad range of educational and professional experience and offer unique insights into the wide variety of methods utilized to design and provide onboarding in academic libraries. This book fills in the gap concerning the current literature for academic administrators, library staff, instructional designers, and trainers.